It’s finally March! The time of year when (depending on where you live) you can start thinking about the transition of seasons from cold, dark and white to green, wet and (hopefully) warm. To contrast, where I’m from, winter isn’t showing any signs of slowing down. So, for those of you who are in the same boat as me, I’ve reached into the “warm me up” playbook and pulled out a chili recipe to manage the cold. Fun fact about chili, according to What’s Cooking America the first recorded batch of chili con carne in America was made in 1731 by a group of women who had emigrated from the Spanish Canary Islands, which historians noted not as “chili” but as a “spicy Spanish stew.” Whether you call it Spanish stew or Chili, this recipe is great for cold evenings and has enough left over for hearty lunches. An additional benefit is that Chili tends to get better after it sits for some time, as the flavours really meld together. 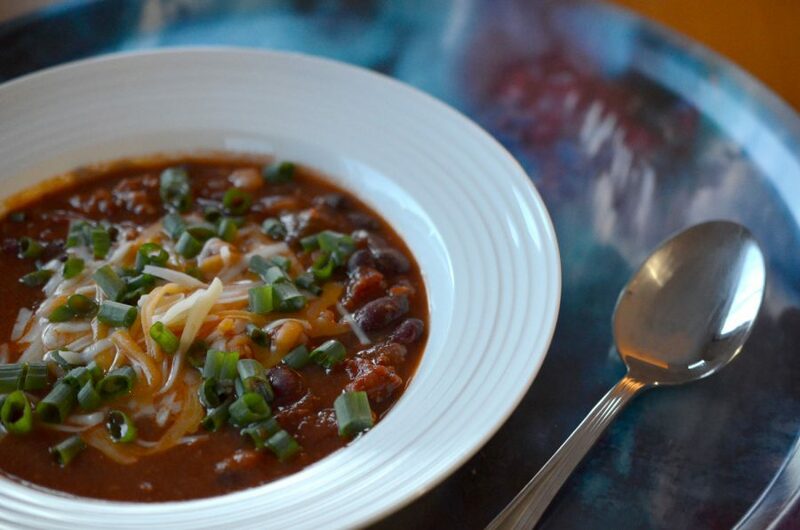 So here’s to spring (hopefully) getting here soon, and if not, at least there’s Chili. *Fun fact: you don’t need to use smoked paprika to get that same smoky taste! Hungarian Paprika has a very similar taste to smoked paprika, but is usually cheaper. You can find it in some Italian grocers and some grocery stores. Or, if you’re looking for a lower cost alternative to grocery store smoked paprika, you can typically buy it at bulk food stores for a much lower cost for volume. In the slow cooker, mix the beef, onion, pepper, paprika, chili powder, cumin, oregano, salt and pepper. Mix until the beef and onion are thoroughly coated in the spices. Add the pork, diced tomatoes, chickpeas, crushed tomatoes, red kidney beans, black beans, garlic and IPA. Mix until everything is fully combined. Set your slow cooker to low for 6 hours. Serve with some shredded cheese and green onions.